7th Rangers: When Dreamer Platitudes Whitewash Bloody Reality - A USC student’s brutal murder doesn’t fit the Left’s preferred immigration narrative. When Dreamer Platitudes Whitewash Bloody Reality - A USC student’s brutal murder doesn’t fit the Left’s preferred immigration narrative. National Review : Xinran Ji, 24, had big dreams. But demons demolished them. 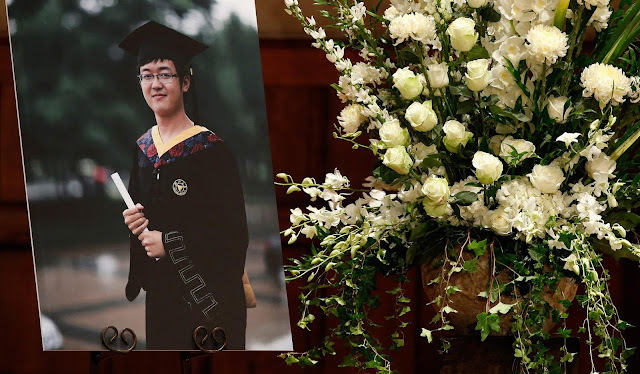 The bright hopes of young Xinran Ji, a University of Southern California engineering student from Inner Mongolia, died in 2014 at the hands of a then-19-year-old “Dreamer” and his thug pals. Mexican illegal alien Jonathan DelCarmen, who first jumped the southern border at age 12, pleaded guilty to second-degree murder last summer in the savage robbery and fatal beating of Ji — who was walking home from a study group after midnight. No, it wasn’t President Trump, ICE agents, Republicans, or conservative talk-show hosts who racially profiled Xinran Ji. It was “Dreamer” DelCarmen and his partners in crime: Alberto Ochoa, 17, Andrew Garcia, 18, and Alejandra Guerrero, 16. The gangsters targeted Ji because he was Asian and assumed he “must have money.” Guerrero had sent Facebook messages about wanting to “flock” (rob) white and Chinese people. Off-campus neighborhoods around USC are dominated by Mexican Mafia affiliates that target foreign students and shake down local businesses owned by law-abiding immigrants. “Dreamer” DelCarmen and his friends stalked Ji on a street corner in south central L.A. before bashing him in the head with a baseball bat and a wrench. The attack was caught on multiple security cameras. Ji managed to stagger home to his apartment, leaving a quarter-mile trail of blood behind him. Sometime during the night, Xinran Ji died in his bed. And the aspirations of his family, who sacrificed everything to send him to America to pursue his studies, perished with him.